With virtually no barriers between galleries or the ramps spiraling up through the Canadian Museum for Human Rights’ complex steel girder structure to the 23-story Tower of Hope, sound could very easily have leaked between exhibits without strict management. The Canadian Museum for Human Rights (CMHR), the first museum solely dedicated to the history and future preservation of human rights, completed and opened the last of its exhibit galleries in November 2014. 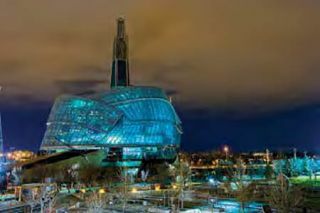 Built at a cost of $351 million at the Forks, a riverside park in the center of Winnipeg, Manitoba, the steel and glass museum was designed by American architect Antoine Predock. CMHR houses 11 galleries, including one featuring temporary exhibitions. According to a list on the museum’s web site, the building’s exhibits include over 100 hours of video; four feature films; an immersive multimedia experience; 26 small format films; 37 large scale linear media projections; 512 video clips; more than 250 artifacts and works of art; 2,543 images; two soundscapes; 18 mixed-media story niches; 19 digital interactive elements; 100,000 words of original text; and seven theaters. Ralph Appelbaum Associates, renowned for its work at the Newseum and the U.S. Holocaust Memorial Museum, was the master exhibit designer. Steve Haas, president and principal consultant with SH Acoustics in Milford, Connecticut, was called in to provide consistency between the designers, fabricators, systems integrators, and media producers, and to manage all of the audio delivery and acoustics. Electrosonics, headquartered in Burbank, CA, provided systems integration. With very few exceptions, every exhibit in the museum has sound associated with it, which meant that coverage had to be strategically focused and dynamic range carefully controlled. “If we just threw two speakers in the front and blasted away that sound would just keep going,” Haas said. SH Acoustics developed what he calls “enhanced stereo,” innovative delivery methods that immerse viewers in the immediate vicinity without encroaching on adjoining exhibits. Only the Brown system utilizes local DSP, to adjust focal time delays between the individual speaker elements. Otherwise, sound delivery is controlled by a Biamp AudiaFLEX DSP system. “We always try to centralize processing so that we can do all of the finagling—routing, mixing, EQ, delay, whatever we need—to manipulate the sound, using certain tricks of the trade to make it feel more immersive but not loud,” Haas said. Steve Harvey (sharvey.prosound@gmail.com) has been west coast editor for Pro Sound News since 2000 and also contributes to TV Technology, Pro Audio Review, and other NewBay titles. He has more than 30 years of hands-on experience with a wide range of audio production technologies.